Presented in a new flask, La Mauny Signature rum is the luxury edition of the distillery.. Presented in a new flask, La Mauny Signature rum is the luxury edition of the distillery. Created by the Cellar Master, La Mauny Signature artfully combines traditional techniques and original style to craft an innovative rum expression. 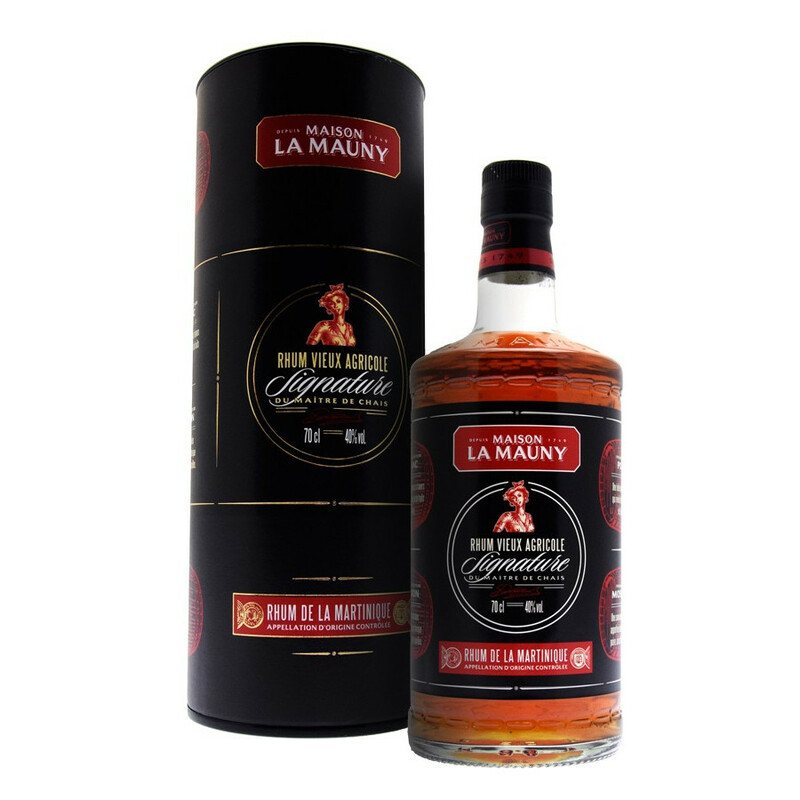 La Mauny Signature is a blend of four spirits aged in four various casks, and develops a stylish, delectable palate. The finish in Port, Moscatel wine, Bourbon and Cognac casks imparts a remarkable palette of flavours, on a subtle, floral backdrop of red fruits. The Earl Mauny, from the breton nobleness, married the daughter of a the Rivière Pilote planter, south of Martinique and created his domaine in 1749. The plantation has a renowned land deem and weather. The Maunay distillery is one of the first of the island to do agricultural rum production. For several years, Daniel Baudin master cellar and Chrisitan Vergier, oenologist work together on the quality of their rums. For them, generosity, roundnest and a wide aromatical palette are Mauny's style. Mauny rum gets the Label AOC in 1996 (Appellation Martinique Contrôlée). Nose: quite aromatic, fruity and floral (red grapes, apricots, dark cherries, honey) with caramel notes. Palate: richly scented, brisk, develops a remarkable palette of smooth and spicy flavours (pepper) with candied fruits. Finish: a refined and fruity finale leaves the place to refreshing, mineral notes. Bronze medal at the General Agriculture Contest in Paris in 2011.